2017 was an eventful year for DigiPen Game Studios. From opening up the Nintendo Switch™ platform for development to showcasing at game events, we have seen Singaporean indie developers cooking up a storm, and we can’t wait to see what new heights they’ll take next year! Here’s a recap on what happened with DGS in 2017. The second DigiPen Game Conference saw the opening of the second round of developer proposals, which now invites game studios to develop new titles on all Nintendo platforms, including the Nintendo Switch™. More than 300 guests enjoyed a preview of working with the new console alongside technical talks from Nintendo and Ubisoft Singapore representatives. Some indie studios also had the opportunity to meet with Nintendo for the first time to present their game ideas and gather feedback. More than 200 participants, ranging from primary school students to working adults, had the opportunity to try out the Nintendo Switch™ console on the Nintendo Switch Experiential Roadshow. The event showcased the console’s debuting titles, The Legend of Zelda: Breath of the Wild and multiplayer party game 1-2 Switch. 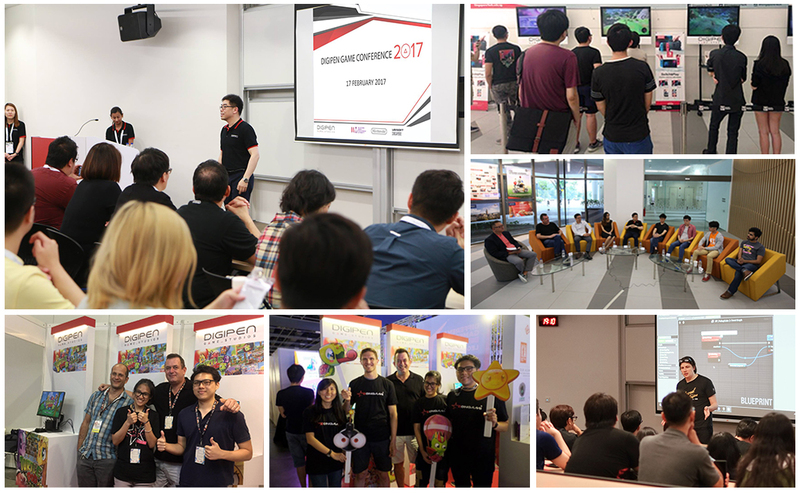 Eight indie studios gathered at DigiPen (Singapore) to announce their plans to develop on the Nintendo Switch™. They are Daylight Studios, Gattai Games, The Gentlebros, PD Design Studios, Rotten Mage, Springloaded, Tyler Projects, and Zengami. The studio representatives talked about their studios, their games in progress, and what attracted them to the Switch platform. Two out of eight indie studios have launched their game on Switch. This marked DGS’s first major showcase since its inception in 2015, where more than 300 people had a chance to try TurtlePop: Journey to Freedom, developed by Zengami. Attendees enjoyed a few early levels of TurtlePop’s campaign mode and competed against each other in the “Lick ‘em Up” multiplayer mode, with many praising the graphics and mechanics. The game also won the Good Game Awards’ “Best in Show – Runner Up” award. The winners were selected by a panel of judges comprising notable gaming journalists and professionals from the gaming industry. DGS held a booth at GameStart Asia 2017. In addition to highlighting TurtlePop’s “Crown Thief” multiplayer mode, attendees had fun posing with cutouts of in-game images like the exploding bomb and the genie. Prior to the public event, DGS’ Managing Director, Tan Chek Ming, also spoke at the GameStart Asia press conference on the 4th of October. Finally, DGS hosted Epic Games’ seminar titled “Exploring VR with Unreal Engine.” Unreal Engine is Epic Games’ game engine developed using the C++ language. The seminar, presented by Unreal Engine Evangelist Chris Murphy, and Director of Education Luis Cataldi, lectured on topics like VR project setup and best practices for optimization. It’s been an active year for us. We look forward to organizing even more exciting events such as playtesting sessions and other showcases for the new DGS game titles we’ll be launching in 2018! Zesty Turtle Surprise, the Platform-Puzzle game arrives! New software update available for TurtlePop: Journey to Freedom on June 28, 2018. DigiPen Game Studios (DGS) works directly with third-party and independent developers to create, publish, and distribute original game titles. By building partnerships with other industry leaders, DGS helps bring the work of Singaporean game developers to a global audience.